My son loves to read. He asks to do his homework and when family and friends come round he wants them to read his books with him. It wasn't always the case. From the age of three upwards Daniel used mainstream books. He progressed to Level Five of the Oxford Reading Tree scheme, and then he was left behind. The leap was too great for him. He could only retain so much vocabulary at that point in his development. I scoured libraries and found nothing suitable. For years I was cutting and pasting to make my own resources for him. I wrote stories for the books based around situations that were familiar to Daniel. A new fictional family was born. 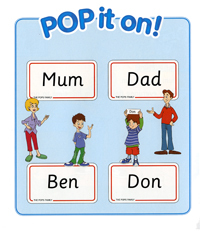 In this range of books and games, we call POPS ('plenty of potential') Daniel is the star of his own learning. For the first time, we have developed a reading scheme, tailored to the specific learning style of children with Down syndrome featuring a child with Down syndrome. Daniel is ahead of his chronological age for vocabulary learning. Language therapists and teachers are in agreement that the resources we used with him have delivered. Daniel went to a mainstream primary school. He was the first child with Down syndrome to attend the school. I was a little apprehensive about what this could mean for him. Miss Pope, his teacher at the time made it clear from the beginning that she was interested in developing Daniel's full potential. It can make a world of difference to have a teacher who is open to new ideas or approaches. As the parent, I knew I had a greater chance of developing materials that played to Daniel's strengths than anything the teacher could cobble together in what little one-to-one time she could devote to Daniel. It probably helped that Daniel did have a teacher for a couple of years who wasn't interested in hearing about what Daniel had been working on at home. I developed it aggressively in that time. I wanted to make material more attractive for Daniel so I got an illustrator. I would love to have bought materials of this calibre for Daniel but there was nothing. I felt my son should have resources that were attractive, played to his strengths and developed his potential. I found it highly rewarding because when I felt angry about the lack of resources, I used that frustration and channelled it into creating my own. People thought Daniel didn't have potential. I am sure other parents of children with Down syndrome come up against this time and again. It is only fair to accept that teachers don't have time to design new materials to better meet the needs of my son when he was the only child with Down syndrome in a class of thirty. Daniel's first teacher, Miss Pope, was exceptional. She has moved to another school and continues to use my books with other children including a child with Down syndrome. 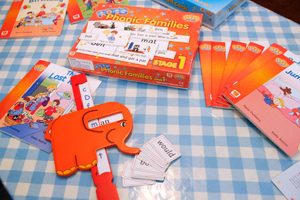 Language therapists and teachers who have invested their time in helping with the development of the first range of materials have been emphatic about its value for children with additional support needs across the spectrum. What started out for me as a passion for my own son's personal and social development has now grown in scale. And it could help thousands of children whose needs are not met by mainstream resources. I know that accepting the model of learning that distinguishes learners as individuals means you start from a point of difference. But children with language delay have similar strengths and shortcomings. The responses to my books have been equal measures of enthusiasm from teachers, parents and children who have used them. 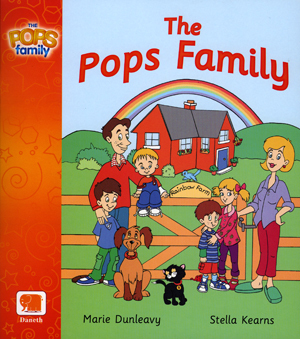 The POPS family works for Daniel and other children experiencing language delay because it plays to their particular strength. Daniel is a strong visual learner. The scheme taps into familiar experiences. Daniel struggles with abstract concepts and embraces everyday ones. I could see Daniel responded better when learning was a physical, interactive experience. One of our games is a wooden house, he can lift the windows and learn words through the window. All the materials I use are meaningful to him because he understands and takes part in something he knows. During the years of cutting and pasting, I was inspired by Patricia Logan Oelwein and Sue Buckley. I knew Daniel had different learning processes but reading the wealth of material helped me to fashion the right materials to make Daniel a reading scheme that was functional but that he could enjoy. I based it on language experience. I began to introduce phonic families, words that were grouped together with a common ending to show Daniel how to blend sounds and to show him that he could be successful decoding words. He likes to talk about family occasions and toys, so I worked those experiences into the material. I isolated words at the bottom of the page and made flash cards to reinforce the learning. I worked with fundamental building blocks of word families, and made a slider elephant game to get Daniel to make words by changing the first consonant. I built the entire scheme on the possibility of success. The books have hidden rewards. If Daniel struggled or made a mistake he could still achieve small successes. It slowly gave him confidence. He became a much more active learner because once he built up a solid base of common words, we were able to move on at a pace that worked for him. As soon as he felt he had cracked it with the first pack, he was on a roll. I think he saw that he had surpassed not only his own expectations, but mine and his teachers as well. Now I am putting all my energies into designing the second pack. I want to develop resources suitable for children up to fourteen years. I want to know that there are materials that cater for Daniel, and children with his characteristic learning style. And I will keep developing them, for as long as Daniel continues to practice and enjoy reading. Logan Oelwein, P. (1995). Teaching reading to children with Down syndrome - A guide for parents and teachers. Woodbine House. Buckley, S. (2001). Reading and writing for individuals with Down syndrome - An overview. Portsmouth: Down Syndrome Education International. Daneth Limited, PO BOX 27096, Edinburgh EH10 6WS, Scotland. Daneth Limited, Viewpoint, 4 Melesian Avenue, Swords, Co Dublin, Ireland.